Hamburg (renewablepress) - The Nordex Group has secured an order for a total of 57.6 MW for a cluster of wind farms in Mecklenburg-Western Pomerania, Germany. The "Hoort" wind farm is a joint project by LOSCON GmbH, a wind farm developer, and mea Energieagentur Mecklenburg-Vorpommern GmbH (mea), a wholly owned subsidiary of the municipal utility WEMAG AG. Nordex is to supply 16 N117/3600 turbines, ten to LOSCON GmbH and six to mea. The order also includes Premium Service contracts, each with a period of 15 years and an option to extend by a further five years. In August 2018 the "Hoort" project was awarded contracts in the third bidding round for onshore wind turbines in Germany. With a rated installed capacity of 57.6 MW "Hoort" will be the largest wind field currently under construction in Mecklenburg-Western Pomerania. Construction is due to begin at the end of 2018 with the turbines being installed in the summer of 2019. Key features of the project to the south of Schwerin are the local value creation and the citizen participation. 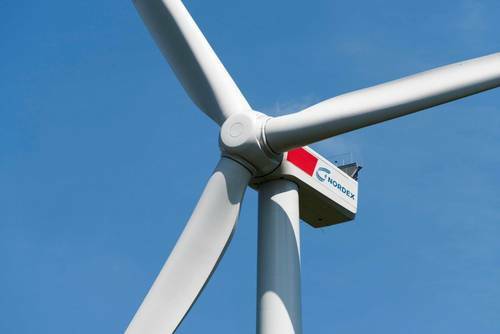 Apart from the turbines, which Nordex will manufacture in its Rostock plant, the manufacturer will also be setting up a service point for maintenance of the wind farm. With rotor diameters of 117 metres and hub heights of 141 metres, the sixteen turbines in "Hoort" will produce around 150,000 megawatt hours of clean energy a year. Nordex and LOSCON have implemented wind park projects together in the past, including the 32.5 MW Suckow wind farm in Mecklenburg-Western Pomerania, with thirteen N100/2500 turbines, which was completed in 2013. The LOSCON Group develops, installs and operates plants for the generation of renewable energy. Since its foundation in 1998 the company has successfully installed mainly wind energy projects in Germany and France, both alone and in partnership with others. Its headquarters are located in Beeskow, in the state of Brandenburg. LOSCON currently has projects with a volume of around 300 MW either approved or at the advanced planning stage in Germany and together with its subsidiary VDN in France. mea Energieagentur Mecklenburg-Vorpommern GmbH is a wholly owned subsidiary of WEMAG, Schwerin. It deals with matters relating to water supply in Bruel. mea also offers services for planning and operation in the field of energy supply. It owns and operates plants for heat generation and regenerative electricity production in Mecklenburg-Western Pomerania. mea has holdings in Erdwärme Neustadt-Glewe GmbH, Brüeler Abwasser¬ent¬sorgungs¬gesellschaft mbH and Bützower Wärme GmbH, SEG Solarprojekt-Entwicklungsgesellschaft mbH and Thüga Erneuerbare Energien GmbH & Co. KG.